God considers life to be the most precious thing and a defenseless unborn child is at the top of of the list. The American Declaration of Independence recognized God's desire and in the proper order. Life, Liberty and the pursuit of happiness. Notice how Life comes first ahead of the pursuit of happiness. Ninety-seven percent of the abortions done in the USA are done for convenience sake. In other words the pursuit of happiness is placed above life. We do not know why you have clicked on this page today. Maybe you have had an abortion or maybe you are considering one. Before you read any further please know that God loves you no matter what and His forgiveness is always available to you. If you have had an abortion this page exists to let you know there is total and complete forgiveness in Christ. We have ALL made mistakes in our lives. No sin is too great to be forgiven by God when we truly, genuinely, sorrowfully, and repentantly turn to Him in our pain, heartache and failure. When we cry out to God in sincerity He hears us and He heals us! Read "I Didn't Know What I Was Doing" and know God loves you! He will forgive you if you call on His Name! What Changed Their Minds...in seconds? Below is an award winning video that has had over 2 million hits in a very short time on YouTube. If you are thinking about an abortion we are asking you to reconsider based on your God given knowledge of how precious life really is. We are also asking you to consider the testimonies of a few women who have had abortions. God can and will forgive you the question is will you be able to forgive yourself. Countless women struggle with their thoughts of a past abortion. Every action we take has consequences. If you need help please contact your local pregnancy crisis center here http://www.lifecall.org/cpc.html. Below are two testimonies from two amazing women about their abortion experience. The first testimony comes from Dina Madsen an ex-abortion provider. Never having an abortion personally when she became pregnant she suffered from post-abortion syndrome due to the many abortions she took part in performing. Read her story and see how God intervened in this woman's life. Then read Lisa's story and find out for yourself (God is no respecter of persons) how God sees you in the light of His love, grace and mercy. If you made the choice in the past to have an abortion don't think God has abandoned you and does not love you. You can't get away from God's unconditional love! He loves you far more than you'll ever fathom! I had to leave my heart at home. I went to work for a Sacramento abortion mill in the first week of September 1990. Before then, the word "abortion" had seldom passed through my mind, and I had no concept of what one actually was. I had lived a "dysfunctional" life and the sacredness of human life was not something I thought of much. My official title at the mill was "health worker." I did various duties-lab work, leading groups (deceiving women about their abortions), "advocating" (deceiving women during their abortions), and assisting the abortionist, which included helping during the abortion and checking to make sure all the parts of the baby were there in the collection jar afterwards. I will never forget, in the second-trimester abortions, holding those little feet up to a chart on the wall to make sure of the age of the baby. Just like everyone else employed there I laughed at the pro-lifers outside the mill and hardened my heart against the truth. If I thought about what was really happening, it became overwhelming. So, I treated the whole issue as a joke-but somewhere along the line God started working on my heart. I started to read literature left by the pro-lifers, and pro-life books. I began to see what I was doing in a whole new light. I saw these babies for what they were-human beings. It was very hard for my heart and head to accept because I had been leaving both my heart and head at home for so long to work there. I began looking towards God and sometimes visiting church and reading the Bible. I know that the only thing keeping me from accepting Christ into my life was the fact that I was involved in murder-the murder of those made in His image. After working there eight months, I could no longer resist God-He had awakened me to the ugliness of abortion. I knew that in every abortion a living human being is killed, and I believe that a part of the mother is killed too. In May of 1991 I left the mill and believed that I had shut the door on my abortion experience. After leaving the mill, I accepted the Lord into my heart and my life, and was baptized. After years of searching, I found my true home in the Catholic Church, into which I was fully received on April 2, 1994. I am now married to a kind and loving man and we have two beautiful boys. It was during my pregnancies that I began to deal with my experience in the mill. I know now that I was experiencing post-abortion syndrome-just as if I'd had an abortion myself, only I felt even worse because I had participated in hundreds of them. God worked on my heart for a long time, showing me His forgiveness, letting me know that I had to forgive myself because He had work for me to do. In early 1994 I finally felt ready to respond to the Lord's calling. I began to sidewalk counsel, picket, and speak publicly. I know I was doing what the Lord wanted me to do, and I was warned and knew that Satan hates God's people and their work for Him. There have been difficult times, with much persecution and attacks from Satan, but I know that the Lord is my protector; His works will prevail! I took a break from my sidewalk counseling to strengthen myself in the Lord-and then He told me it was time to go back. I just am so grateful that He pulled me out of the darkness and into the light. He has shown me how terribly evil abortion is. He has shown me how precious life is. He has shown me that every preborn baby is His child, and that no one has the right to take that life. He has shown me that there is forgiveness and healing in Him. For those who have participated in abortions or had abortions I pray that the pro-death people will have their hearts changed and believe that life is the only "choice." My walk with God has not been easy. Life is full of ups and downs, joy and pain. But I know that He is always there beside me. He has blessed me beyond anything I ever imagined, and continues to do so. He can do the same for anyone if He is only asked to. I think it's important to pray for those women who are considering abortion and also for those caught up in the evil of the abortion industry, that they will see the truth and be set free. Abortion is not just a "choice," it is a destructive, life-taking act that will only bring pain and loss to those involved. Often when I talk to people about my involvement with Crisis Pregnancy Ministry they will innocently rattle off a pro-life bumper sticker slogan like, "Great ‘choice’….baby killing!" or words with a similar sentiment. I know in my heart that these people are attempting to affirm my involvement with this ministry and show me that they understand what it's all about. Unfortunately, what they don’t know is that I’m a post-abortive Christian woman and that their comments bring condemnation for sins forgiven, and blows to wounds still tender. Grace is real. And grace is very powerful. It is at the Lord's leading that my name not be withheld as a bold demonstration as to the power of His grace. If you are willing to go on this difficult and painful journey with me, you will see for yourself how the power of grace can change a life to the glory of God. When I was 26 years old I became pregnant. I was single, had a college education, a career in management and had recently become a Christian. Everything about me looked good on the outside; however, on the inside I was suffering from eating disorders and had problems with alcohol. I had been a loner for many years and didn’t have a close circle of friends. I had also been estranged from my immediate family for 6 years and had no one to confide in, or turn to. I knew my boyfriend didn’t love me and that it was an unhealthy, even abusive, relationship. I was alone in the world, and I would not allow myself to consider that I had any option other than abortion. I couldn’t emotionally afford to do so as I was bankrupt in so many ways already and barely surviving. I was already at the very end of my rope and I had no one in whom I could trust. I didn’t know very much about abortion although I had read a few articles in the newspaper about it. I always assumed abortion was a lofty debate about morals, and that the outcome only affected girls in high school. For me it was about a passionate fight between the pro-life and pro-choice people, one that I didn’t think could ever be resolved. I ignorantly assumed abortion was illegal, as I thought most immoral things were. Having always had a cycle like clockwork, I feared I was pregnant as soon as I was two days late. I quickly secured an over-the-counter pregnancy test and the result was positive. I was frozen with extreme fear, overwhelming shame and looming disgrace. From that point on I was like a zombie and I never looked to the right or the left, only forward toward abortion, as if my only other option were suicide. I could not allow myself to consider the fact that I was pregnant to mean that I was carrying a baby and I chose to believe I still had a ‘choice,’ even after the pregnancy test was positive. I now recognize this was a horrific lie that I received from the pro-choice movement. Unable to sleep, in the wee hours of the morning, I watched TV and stumbled upon The Silent Scream, which is a movie portraying an actual abortion at 11 weeks gestation. Although I found the images shocking I rationalized that the child on the screen was from an advanced pregnancy and that I was only three days late. All kinds of modern slogans like "it’s only a blob" or "a few cells" and "an untimely pregnancy can ruin a woman’s career" and "women have rights and choices!" were hedging me in and giving me courage to abort. Around 4 in the morning I bought a newspaper and went to sit at my desk at work, to look in the classified ads for an abortion clinic. As much as I wouldn’t allow myself to consider that I was carrying a baby, I knew deep in my heart that what I was doing was wrong and that it needed to be done in secret and under the cover of darkness. Mixed in with the abortion clinic classifieds there was an ad for Birthright International (a crisis pregnancy organization). From the name I gathered it wasn’t an abortion clinic and I can’t say why I called that number, but I did. Perhaps I possessed the slightest hope that maybe, someone, somewhere, could, or would help me. I waited with terrible anxiety as the phone rang and rang. Eventually an answering machine picked up with an enthusiastic-sounding man’s voice, speaking very quickly, like he was desperate. The way he spoke alarmed me. I couldn’t emotionally afford to feel desperate or allow myself to consider something was at risk. I had to use everything in my power to stay calm and zombie-like. I had rights and choices. It was still dark and I was safe. The voice urged that if it was an emergency to call another number, but again, the word "emergency" made me uncomfortable. What if I allowed myself to admit this was an emergency? How could I take refuge in my ‘choices’ if I realized that something was at stake or in danger? I looked at my watch and decided I didn’t have to courage to wake up a stranger or to wait for sunrise. I needed immediate resolution and so I called an abortion clinic and, even at that early hour, a person picked up the phone. I made an appointment for that afternoon. As I drove to the clinic I was aware of the contrast in the sunny, clear, beautiful spring day and the way that I felt. I wished it were dark and dreary. Although I felt the beautiful sunshine inappropriate the warmth comforted me. The waiting room was filled with anxious-looking boyfriends, girlfriends, sisters and moms. Women seeking abortions went into another waiting room immediately, where we were quickly checked in. I was given a blurry medical form that had been copied so many times that one whole corner of it was clearly missing. I was also given a clipboard and my medical form was placed on top. As I sat at the end of the nurse’s desk I gazed up and noticed there were about 30 pieces of white medical tape, all in a long row, with a corner of each piece stuck to the shelf, so that the clipboards could be made up quickly. A piece was taken from the shelf, secured to the metal clip, and my name was written upon the tape. Under my medical form was a manila file that had my name written upon so many layers of white-out that it cracked when I bent it. I was taken to a restroom and told to put my clothing in a cubby and to come out in a hospital gown. All the cubbies were filled, so I rolled my clothing up in a ball and placed it in the corner on the floor. I was given a quick exam and told that I was at least 6 weeks pregnant. Although I knew that couldn’t possibly be true, I didn’t say a word. The doctor was kind and friendly, although rushed. He said it was all no big deal and soon I wouldn’t have a problem anymore. He never asked if I had any questions. After the exam I was taken to a long, narrow room lined on both sides with chairs that were filled with women in hospital gowns, bathrobes and one even had a stuffed animal. Although I sat completely silent, the only discussion around me was about abortion. So many different kinds of women were sharing in that long room, with a wide variety of ages and situations. Some were recently out of college and just landed their first big job, some were in high school and their moms brought them against their will, one woman was married and her husband didn’t want any more children, one was afraid of losing her boyfriend if she didn’t abort. Everyone had a different reason and story. No one looked pregnant. One conversation was about the pro-life protesters who were outside the clinic as they entered the building. The women talked about how the chanting, slogans and scripture verses made them feel terrible, but that the experience of walking through the protesters didn’t change their situations or reasons for abortion. One woman with tears in her eyes said, "What? Did they think I came to this decision lightly?" I didn’t see any protesters as I had been the last one to come in, and I was grateful. As the conversations continued one woman voiced her heartfelt concern about whether she would still be able to get pregnant in the future. We were all shocked as a 3rd year college student assured her that there would be other pregnancies, as she was at this same clinic for her third abortion (she was the one with the slippers, fuzzy bathrobe and teddy bear). Every twenty minutes or so, a big heavy door at the end of the long room would open and each time we all jumped. When it would open the next woman would get up and go in, some looking back, some not. 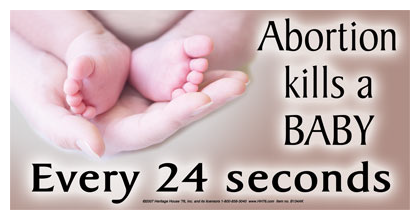 Once the door shut again they would continue in their nervous whispers about the "who," "what," and "why" of abortion. One woman spoke up rather boldly and said there was no way she could possibly be 6 weeks pregnant. She said she knew it couldn’t be true as she rattled off various dates, making her case. Then another woman said the same thing, and then another. Just then a nurse entered and said the conversation needed to end or we would be asked to leave. That subject was not revisited. Another conversation was about who brought us and who was waiting to drive us home. Until that point I still hadn’t spoken a word when someone singled me out and asked me the question. "No one," I replied, "I came on my own." And of all the shocking, pathetic and horrifying stories shared in that long room, this one seemed to devastate everyone the most. The reason for this, I believe, was because we all understood we were there to destroy a part of ourselves, but at least someone was there with each of them, to help deal with the pain that would be both physical and emotional. I was alone and would be utterly more so after the abortion. And we all knew it. I was glad when the door opened again, distracting everyone. The events of the past 24 hours were starting to catch up to me, and I found myself swept under an intense wave of exhaustion. I was the last woman to go through that big, heavy door, at the end of the long room. The room where the abortion was performed looked like any other OB/GYN office and I was very quickly put to sleep with a shot of medication. The next thing I remember was the room swimming and I was being helped down and into a recliner in the next room. I was given a very large tablet for the pain and told that I would have abdominal cramping for the next 24 hours. The staff wanted to go home and although I was still very groggy I tried to gain my bearings and get dressed. I drove myself home. I went on with life and tried, unsuccessfully, to pretend that it all never happened. Although the lies of the ‘choice’ campaign gave me the courage to choose abortion, it did absolutely nothing for the pain, suffering and confusion following it. I was faced with the harsh reality that I had done something horrible and that it could not be undone. I believed my sin was too great for Christ’s forgiveness and I attempted suicide. The Lord intervened in the attempts to end my life and from that point on I pursued a relationship with Him with an intense, fiery passion and complete abandonment. I drastically turned my back on the ways of the world and threw myself into the studying of God’s Word, prayer and fellowship with the body of Christ. Two years later the Lord blessed me with a wonderfully loving, godly husband. There were still great challenges to my healing in the area of post-abortive regret. Life constantly presents reminders of the choice I made so many years ago. When I gave birth to our first son I was overwhelmed with powerful feelings of love for him. Until then I had never known "the love of a mother" and experiencing as much created a painful contrast between my first pregnancy (ending in abortion) and that one (producing the first of three amazingly beautiful children). Staring in amazement at our beautiful son I couldn't help but remember the child I aborted. Loving our children as much as I do, I could not begin to express the concept of not having one of them. It is beyond my ability to even ponder. However, there is currently an empty seat in my mini-van, which would not be empty, had I not exercised my ‘choice.’ There could have been another wonderful child sitting in that seat, or in our pew at church. This reminder and countless others requires daily access to God's grace. If God's grace were not real or very powerful these reminders would be too much to bear. My post-abortive healing was a long process because it me years to fully comprehend the consequences of my decision to abort. It was a scary healing to pursue because in order to attain it I first had to allow myself to feel the pain of admitting the fact that I destroyed my child. It brought me back to the Garden of Eden and the desire to point fingers because of lies spoken and believed. Lies or no lies, the responsibility was mine and until I could admit as much I could not truly ask forgiveness or receive God's immediate reply, which is and always will be, grace. My complete healing took 13 years. Statistics show one in three women, sitting in any church in America, on any Sunday morning has had at lease one abortion. Please, be very careful. God has a plan to heal the broken hearts that are hiding behind the assumed, yet false security of secrecy. You do not want to be the one to stand in His way or to keep them in their painful prisons. Although my husband and I are pro-life, our hearts are very tender in our efforts. We are just as concerned about not building a wall of judgment and condemnation between a post-abortive woman and God’s grace as we are about protecting the life of the unborn. God loves both, women and their unborn, equally. There is only one unpardonable sin recorded in the Bible (Mark 3:28-29) and it’s not abortion. Well-intentioned pro-lifers can create an atmosphere of judgment and condemnation in their efforts against abortion. Until this ends, the voices that can most intimately represent the devastation caused by abortion will remain silent, hushed under a veil of fear. Post-abortive women can personally and powerfully attest to the utter lies shrouded in the ‘choice’ campaign. If you want to help put and end to abortion, help these women access grace, receive their healing and find their voices! My husband and I vote pro-life; we participate in peaceful pro-life marches and pray for a change in the legislation. However, we do not believe these efforts will bring victory in the arena of abortion. This battle is too enormous to fight with bumper stickers, slogans, demonstrations, campaigns and even legislation. I believed abortion to be illegal. No one made me have one. I watched The Silent Scream the night before. I called Birthright the morning of. I knew what I was doing was wrong. I saw the condemnation caused by the pro-life protesters on the faces of the women in the abortion clinic waiting room. And I was a Christian. Yet I still chose abortion. Why? Because ours is not a battle against flesh and blood, but against principalities, against powers, against the rulers of this dark age (Ephesians 6:12). Satan is the father of all lies (John 8:44) and the ‘choice’ campaign is full of them. The Word says, "Satan was a murderer since the beginning." His plan of attack through abortion is extremely well fashioned to destroy mother, child, family, honor, respect and sanctity of life. Please guard your lips as you share your heart about abortion. Ensure your words express love, grace and mercy or your efforts will be rendered fruitless, not by Satan, but by our righteous God who will not allow even a condemned sinner to be slandered because of the sacrifice His Son made, so that they could be forgiven. Only when we seek our Father with a heart of love, and not condemnation, will our prayers be answered. Only then will we see great strides in defeating our enemy and the devastation caused by abortion. As I typed this testimony there was a chorus circling around and around in my head. and glory in the place of despair." That chorus is based on Isaiah 61, which is an amazing scripture that contains a calling, anointed by the Holy Spirit, to release the prisoners from darkness. It says, "He has sent me to bind up the brokenhearted, to proclaim the year of the Lord’s favor." My God has not cursed me; He has blessed me! He has not condemned me; He has forgiven me! He has not forsaken me; He calls me, and anoints me, and loves me with an everlasting love that is beyond my comprehension! The blessings of Isaiah 61 are not only for me, but also for all that would receive them in Christ Jesus. We have access to glory in the place of despair! The Lord's heart is for the hurting to be healed! Beloved, if you suffer from post-abortive regret, please respond to the Lord’s invitation to receive His healing touch. You don’t need to live with the pain, shame and condemnation anymore. A wonderful door is open for you. The door is called ‘Grace’. If you or anyone you know is suffering in the area of post-abortive regret, please do not hesitate to contact me. It is the Lord’s heart to heal your hurt and to give you a garment of praise to replace your veil of shame. His son died so that you might not suffer, so that you could be set free and live in the abundance of His love. It is at His leading that I openly share this testimony. It is my prayer that it will give you the courage to seek refuge in the arms of our loving Father. He is waiting for you. Come. Note: Heartfelt gratitude to some special women for their assistance in editing this piece. It was very difficult to write and more so to share. I couldn’t have done it without your love, support and prayers.